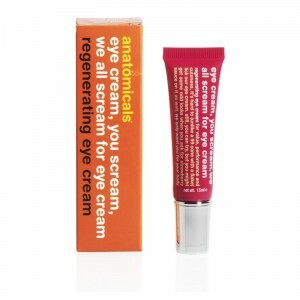 SKU: 6810397 Categories: Anatomicals Under Eye Care, Face Care, Popular. 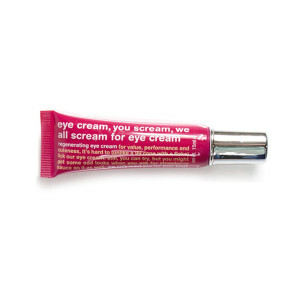 Tags: €10 & under, Anatomicals Scream For Eye Cream, eye scream, regenerating eye cream, screm for eye cream. For value, performance and cuteness, it’s hard to (unlike a 99cone with a flake) lick our eye cream. still, you can try, but you might get some odd looks when you ask for strawberry sauce on it as well. Plus no matter how much of this product you may use, it promises not to make you obese and clog up your arteries. The cream is made to tame down little wrinkles and to hydrate. It really does that and besides that you will also notice that it reduces your dark circles as well. It feels really refreshing, and unlike a lot of other creams it doesn’t burn or ‘pull’ when you apply it. The cream is not thick either…just really refreshing. You also just need a tiny bit, as it goes a long way. An amazing cream! Apply morning and night to the delicate eye area and gently pat with your ring finger.